Laura Hurtado, who curated the Plural and Partial show at the Rio this month (see left column), says she might throw into the mix a work of her own: a performance piece. The exhibit is about intergenerational relationships, so it seems appropriate that Hurtado is due to give birth to her third child some time during the exhibition; and with her due date just days after the April 18th reception, it might happen right there in the gallery. The Rio show is only one of the exhibits the expectant mother has curated this month. On Friday April 4, the grand opening of the Granary Art Center in Ephraim will feature another Hurtado-conceived show, Land+Place+Performance, which features six Utah artists whose work explores mark-making and the land as a site for aesthetic exploration. All this labor is in addition to Hurtado’s day job as the Global Acquisitions Art Curator for the Church History Department of the LDS Church. It’s a position she took in December 2012 when Dr. Rita Wright left her role as curator of Art and Artifacts to become Director of the Springville Art Museum. Wright’s former position was slightly re-framed to focus on acquisitions when Hurtado stepped in. While works acquired by the Church History Department may appear in future exhibitions, be displayed at the Church’s Museum of History and Art or in the Conference Center in downtown Salt Lake, the acquisition process is also about preserving a cultural record, a visual catalogue of expression surrounding Mormon culture. For Hurtado that expression isn’t restricted to active LDS members, but rather includes all forms of expression surrounding the Mormon experience. Hurtado spends as much time as possible familiarizing herself with those expressions, both inside and outside the state. A recent trip to New York gave her the opportunity to meet with a group of contemporary Mormon artists working in the area. Locally, she has immersed herself in the art scene. 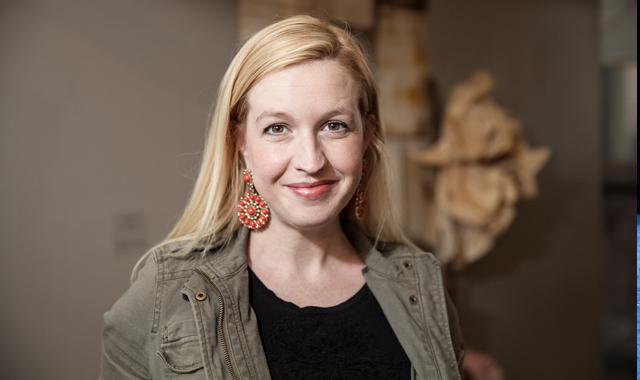 She has curated several shows, is a regular writer for 15 Bytes, has served on boards such as the membership chair for Friends of Contemporary Art at UMFA, and has presented art talks at BYU, Snow College and other institutions. For UMOCA’s Utah Biennial last year she curated Mondo Mormon: Cumorah, Christo and the Celestial Style, and is pleased that from that exhibition was able to acquire for the LDS Church J. Kirk Richards’ Christo Series (which yes, features a lot of Jesus paintings, but they aren’t smiling). Wearing that authorial cap, Hurtado will be curating the LDS Church’s 10th International Art Competition that will open in 2015. The competition attracts works from around the world, and Hurtado hopes to cast a very wide net for the upcoming competition. Yet Hurtado’s curatorial headgear is versatile. “I think it’s important to step out of one’s office and to engage with larger conversations and to search out ways other people are solving problems and finding solutions to issues you’ve just discovered,” she says. Her time outside the office is attested to by a number of independent projects as a curator, ones she is careful to stress she is doing as a freelancer, without any affiliation with her day job. In 2013 Hurtado curated Love Hours, a very personal project that she says was both an extension of the research she had done for her master’s thesis, and in other ways a very personal reflection of her experience as a parent (see our review here). The two exhibits she is curating this month feature artists from a variety of backgrounds, working with diverse media and themes. “I enjoy working with art and artists that are asking questions other than religious ones,” she says. Land+Place+Performance, at the Granary Art Center for the next two months, features work by Al Denyer, Rachel Farmer, Levi Jackson, Will Lamson, Jared Steffensen, and Claire White. For the exhibit, Hurtado focuses on ways artists use the landscape not as a blank slate but as a stage in which to investigate aesthetic ideas. Specifically, she highlights artists who explore mark-making, like Will Lamson’s “A Line Describing the Sun,” a performance piece in which a lens mounted on a rolling apparatus was used to follow the path of the sun and inscribe a line into the hard clay of the Mojave desert; or Jared Steffensen’s “Untitled (Wall Drawings)” that uses the wheel dirt gathered from a skate board from specific sites (in this case, the Granary basement and parking lot) as a drawing tool that maintains the echo of a particular site. “They are about landscape and place, so Utah as site is certainly what is being responded to but not exactly as it is stereotypically summarized and framed,” Hurtado says. Ultimately, Hurtado sees her curatorial projects as balancing acts, whether it be balancing aesthetic issues with religious messaging, or local and regional concerns with a larger, international discourse. And as will be particularly evident this month, it’s also about balancing work with life. Land+Place+Performance, curated by Laura Hurtado, opens at Ephraim’s Granary Art Center on April 4, 6-9 pm and continues through June 28.